It’s Monday again, which means it’s time to whittle down Diamond’s lengthy list of new releases to a more manageable size. Here are this week’s noteworthy books. ATOMIC ROBO GHOST OF STATION X #4 (OF 6) – There’s a lot more serious action in the most recent mini-series, and while I miss some of the levity, it’s still an excellent read. Pick of the week! AVENGERS X-SANCTION #1 (OF 4) – Because you’ve GOT to have a quarterly event, Cable hunts down the Avengers. Sure, why not? GODZILLA LEGENDS #2 (OF 5) – I spoke of my mixed feelings for number one, and I’m nervous for the second issue, but it’s earned another shot. NIGHTLY NEWS ANNIVERSARY ED HC – I’ve only recently read Jonathan Hickman’s first mini-series, and I LOVED it! This hardcover has a ton of supplemental material, and right now Thwipster has it for 45% off. Score! RED WING TP – More from Mr. Hickman, but I’d honestly give this one a pass. And that’s it for this week. I’m off to dive back into Aquaman annual #5, where he gets turned into an orangutan. My pull list is updated, and I’m kind of excited to get back into the weekly comics game. Expect conclusions soon. What’s looking good to you this week? Welcome to the first installment of 2011’s weird experiment, where I look at the new comics coming out this week that I probably won’t buy for 3 months. SCIENCE! 27 (TWENTY SEVEN) #2 (OF 4) – Well, right off the bat we come to one I WILL pick up this week, since it’s an Image book. I really enjoyed 27 #1, wherein a musical genius gives up everything to regain his talent. This is a quite promising story, but I hope this becomes more about the price we’re willing to pay to regain something we’ve lost rather than just a story about a guy who can’t play the guitar anymore. Either way, Golden Age format! AVENGERS CHILDRENS CRUSADE #4 (OF 9) – Despite hearing some pretty positive things, I haven’t picked this book up. With the new rules, sure we’ll give it a go. BATMAN BEYOND #1 – The Batman Beyond mini was a surprise winner, and I’m glad it’s getting an ongoing. The concept and creative team have some real legs. DC COMICS PRESENTS LOBO #1 – This is one that will have to pass the flip test to go on the list, but why not? STARMAN CONGORILLA #1 – Despite my love for Mikaal Tomas in the 90’s Starman series, James Robinson has seemed to go out of his way to make this an all new, all different character since his reintroduction in Cry for Justice. Still, I’m a sucker and will love to add this to the list. STEEL #1 – Steel hasn’t held much interest for me other than his appearances as the Justice League’s “Forge” in Grant Morrison’s run, but I’m willing to give it a shot. THANOS IMPERATIVE DEVESTATION – I’ve spoken in the past about my love for Thanos. I’ll be looking for the rest of the Thanos Imperative issues at a discount, so I may as well add this to the list. I just hope they spell “devastation” right on the cover. After talking with Matt last week I was finally able to cut the cord and let Green Lantern go. Similarly, I couldn’t bring myself to pick up last week’s THUNDER Agents reprint. I was happy to see Shield came out, although I was horrified to realize I had completely forgotten about it since it hasn’t shipped in so long…That’s never a good sign. I also got hooked up with the first two issues of the highly-scrutinized (by me, anyway) Batman, Inc. It was brilliant, as hoped, and if anything convinced me that Grant Morrison knows what he’s doing, it’s when Selina asks Bruce what he’ll do when Batman’s enemies come after Bruce Wayne and he replies “You’ll see.” I’m looking forward to it. Leave a comment Posted in Apes in comics, This Week's Comics Tagged I give in and admit to the awesomeness that is Batman Inc, to boldy go, where's Grundy? Nothing for me this week, but that’s okay, because it gives me the chance to snipe from the sidelines. Here are this week’s commentable books. ACTION COMICS ANNUAL #13 – If it weren’t for the $5 price tag I would be all over this, the first meetings between Lex Luthor and Ra’s Al Ghul and Darkseid. Who am I kidding…I may pick it up anyway. DC COMICS PRESENTS BATMAN BEYOND #1 – If you’re interested in getting into the Batman Beyond books without digging through back issue bins, this is the place to get started. DC provides a good intro for $8. Well done. 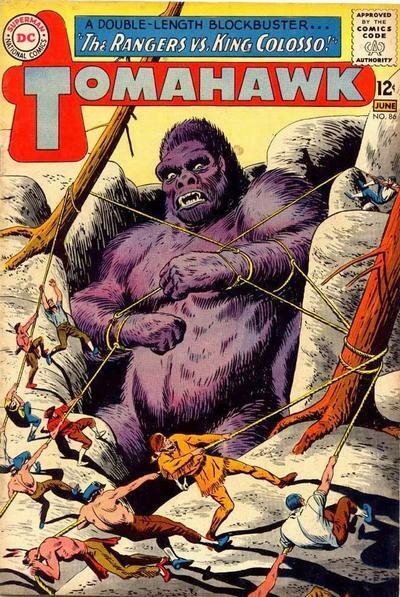 GORILLA MAN TP – And on the side of how to collect things wrong, here’s Marvel. Even at the ridiculous cover price of $4 per issue, buying this entire series will only cost you $12. This trade is $20. Unless there’s some significantly valuable additional material (each issue also had reprints of stories about earlier Gorilla Men) there’s no reason to pick this up instead of the individual issues. VERTIGO RESURRECTED WINTERS EDGE #1 – I really enjoy the Vertigo anthologies, as they point me at titles I may not otherwise sample. This one may make it home, too, since I’m pretty far removed from most of Vertigo’s offerings these days. I wanted to disagree with Matt’s review of Batman and Robin #17, but I couldn’t. 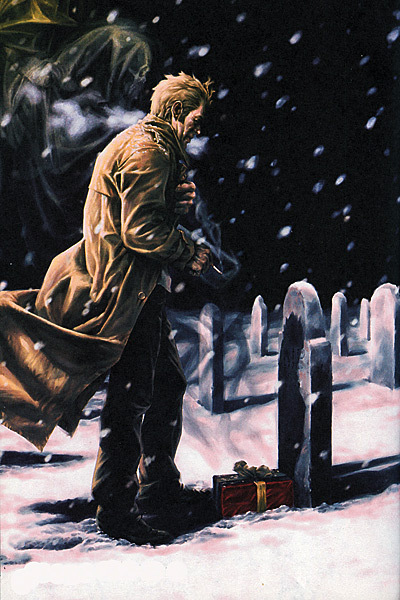 Paul Cornell’s story is a very by-the-numbers Batman tale and Scott McDaniels’ art is passable but not great. I think he was the right artist at the right time for his run on Nightwing, probably his best book. Chuck Dixon (and this is no slam) writes straight-ahead action stories without much dialog or nuance, leaving plenty of room for the art. This fits right in McDaniels’ wheelhouse in a way none of his more recent work has. Still, I hope this doesn’t put anyone off Cornell’s other books, namely the Knight and Squire mini (on stands now!). Batman Beyond and Avengers and the Infinity Gauntlet both came to satisfying conclusions last week, and are well worth picking up. I haven’t cracked Batwoman yet, but am looking forward to it. As for Fantastic Four…Well, if my pick last week or Matt’s Game Tape hasn’t convinced you yet, nothing will. This book never fails to please. Leave a comment Posted in Agents of Atlas, Apes in comics, This Week's Comics Tagged Overpriced Gorilla Man, Vertigo!, What happened Paul Cornell? Animals have been used for military purposes practically since the invention of war. The most obvious examples would be the horses in a cavalry unit or homing pigeons to send secret messages. However, one of the most bizarre and extreme examples occurred during the War of 1812. The British were eager to capture Washington DC because it’s access to water. The reason for this was that they needed a sufficient port to unload their secret weapon: King Colosso! King Colosso was unleashed and immediately told to destroy the monarch-hating yanks. Undoubtedly the war would have ended differently had Colosso managed to capture New Orleans, having sacked Washington DC and decimated forces in a southward fashion. Much to the surprise of the redcoats and King Colosso, the American forces under the command of General Andrew Jackson had discovered Colosso’s weakness. Old Hickory had learned that Colosso’s hide could only be pierced by cannonballs fired from the mouths of alligators. The reptilian artillery kept the giant beast at bay. While the British returned home, Colosso was forced into the wilds of Tennessee to lick his wounds. It was years later that he was captured by the frontier hero known as Tomahawk. Sorry guys and gals, no list this week. I’m actually sending this post into the future from Wednesday! Wow…I’m not actually picking anything up this week. That’s okay, there are still some things worth talking about. DC COMICS PRESENTS GREEN LANTERN #1 and JACK CROSS #1 – I’m really curious to see how these DC Presents books turn out, as they’ll be reprinting decent-sized chunks of comics for $8. GHOST RIDER BY JASON AARON OMNIBUS HC – I’ve mentioned a few times how much I’ve loved Jason Aaron’s Ghost Rider run, and now you can get the whole thing here in one big chunk. It’s pricey, and you can probably find the individual issues for less, but you can only bludgeon small varmints with this volume. IMAGE FIRSTS HAUNT – I was fairly impressed with this book until I got further in and became convinced it’s just more of the same McFarlanage. Still, if you’re curious or like your comics Spawny, this is a good way to give it a try. UNCANNY X-FORCE #1 – A new X-Force team vs Apocalypse? I like the idea, just not the price tag. to follow. I haven’t been able to bring myself to read the last issue of Atlas. I’m no good at saying goodbye. Somehow, Deadpool Team-Up slipped under my radar two weeks ago. 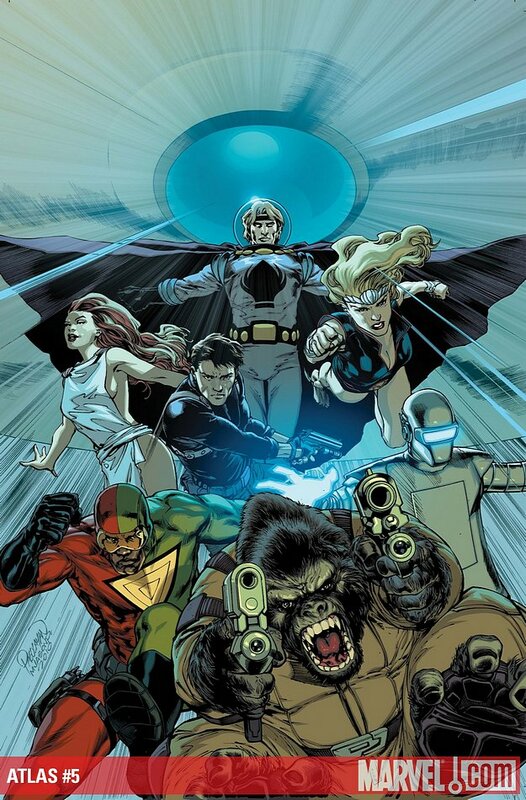 Written by Jeff Parker and co-starring Gorilla Man, I really like the idea of this book teaming Wade up with all sorts of characters AND having them written by the people who know them best. Good call Marvel. I’m looking into diving into this one. A second consecutive week of comics and Game Tape? I thought it a thing of the past too, brothers and sisters. Yet it is here waiting for you. Jump into the internet’s 35th least read weekly comic book review blog. Agents of Atlas #5 was out this week. It marks the end of another Jeff Parker title. Forgive me for not reviewing it. Even writing this much has me a bit verklempt. Having forgotten my copy of Fantastic Four last week, I fixed the error. This is one of those books that I’m always looking forward to when it comes out. Since Hickman took over writing chores, this title has made the climb to the top of the read pile; it’s that good. I see what Jesse means about Doom being a part of the family. I’d never thought of it that way, but it makes sense. I’ve also always been curious to see if a writer would further develop/exploit the connection between Doom and Valeria that Waid established in his run with the late great Wieringo. I’m glad Hickman is picking up that little thread. How many Galactus bodies are there floating around now? 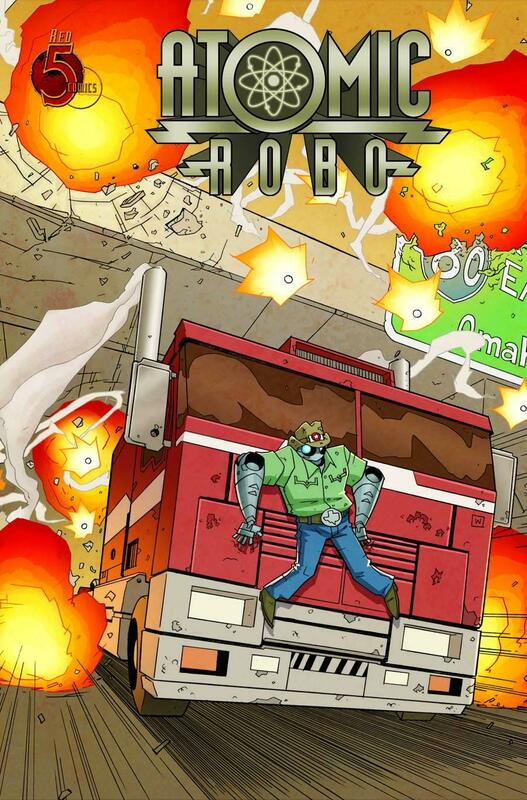 While I haven’t yet read the whole thing, I object to IDW’s GI Joe: Cobra Special #2. On principle, I do not appreciate that we got 22 pages of comic story and 33 pages of prose that is actually a preview/sample from a new collection of prose GI Joe stories. It might be the best thing I’ve ever read, but it’s still a 33 page house ad. No… just no. On the other hand, Action Comics #893 impressed and entertained on so many levels. All you need to know about the main story is encapsulated in a quote by Gorilla Grodd, “Kneel before Grodd! You have walked into my ambush! And I have brought my biggest combat spoon–to eat your tasty brains!! !” This is the brilliance of Paul Cornell, and brother if that don’t butter your popcorn, don’t let the door hit you where the good Lord split you. I even enjoyed the second feature starring Jimmy Olsen. Superman’s pal is one of those ideas I really love but have rarely liked past the Silver Age. Modern stories with Big O are rarely executed well. Most writers have him come off as either a doofus or a hipster. He a bit of both with some many other interesting layers. Nick Spencer has found these layers and crafted a character that is interesting to read. I tip my hat to Mr. Spencer for making me care about a story that featured Jimmy Olsen and was billed as being the “first comic book appearance of Chloe Sullivan of Smallville“…whatever. It’s a nice beginning for a story. I’m looking forward to seeing it resolved as much as I am seeing the resolution of the main Luthor story. That’ll wrap it up for this light week. Except for two special shout outs. H.D., long time supporter of Jesse related madness, celebrated a birthday this week. So happy birthday to you; I sang “O’ Dem Golden Slippers” in honor of the anniversary of the day of your birth. Another light week, and a sad, sad day for comicdom. I’m picking up one book this week, ATLAS #5, which brings that series to a close. Since Jeff Parker has brought Jimmy, Ken, and pals with him on other books he’s written I don’t think this will be the last we see of them, but it’s disappointing that such an excellent book can’t find the sales numbers it needs to stay running. Last week saw some very good books come out. Fantastic Four continues Jonathan Hickman’s incredible run, with new artist Steve Epting on-board with his stellar pencils. I was especially impressed by the scene with Doom, where it really dawned on me that Victor is a part of the family as much as anyone else. Sure, he’s the crazy uncle nobody talks about, but despite multiple murder attempts it’s clear that he’s as much a part of the family as Ben Grimm. Just not, you know….welcome. Going into this issue Galactus is dead and Doom has lost his intellect. Are these hanging plot threads from Mark Millar’s run? And speaking of Millar, I continue to be pleasantly surprised with Nemesis. The book has plenty of action, enough twists to keep me engaged, and the characters are in precarious enough positions that it doesn’t feel like one issue is going to be enough to wrap everything up. Knowing Millar, it will be just enough.